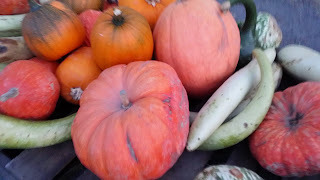 Abundance Wine Country: And More Squash! We're still eating squash...and loving it. In fact, right now, with the leaves still golden, coral and salmon outside, we're in the mood for foods in those very same gorgeous warm and rosy colors. Autumn season is short and sweet, why not celebrate it in every way possible? This is a truly delicious dish. Serve it with rice and you've got a meal. We're loving the Tru Roots sprouted brown rice these days. It has a great texture and the sprouting makes it more alkaline and easier to digest. Yes! Healthy, plus delicious, is our favorite combination. Put the coconut milk and curry in a stock pot and whisk together over medium high heat. Add the broth, fish sauce, lemon grass, turmeric, and squash and cook ten minutes. Add the garbanzo beans and cook another ten minutes watching the squash until it is about 5 minutes away from being cooked. Add the salmon* and mushrooms and cook another few minutes until the salmon just barely cooked. Add the bok choy leaves. Serve in bowls with rice and sprinkle cilantro over the top. *If you find it difficult to remove the skin from the salmon, place the whole filet in the soup pot skin side down for about 60 seconds. Pull the filet out and the skin should peel off easily. Chop the filet and add back to the pot to continue cooking. With a fork, slightly mash together all of the ingredients except the eggs. Stir in the eggs just enough to coat the other ingredients. Spoon into the center of einkorn pastry circles (see here for recipe). Fold up all of the edges 1/3 of the way to the center and press onto filling. Bake at 350 degrees for 30 minutes or until filling is just firm to the touch and crust is golden brown. 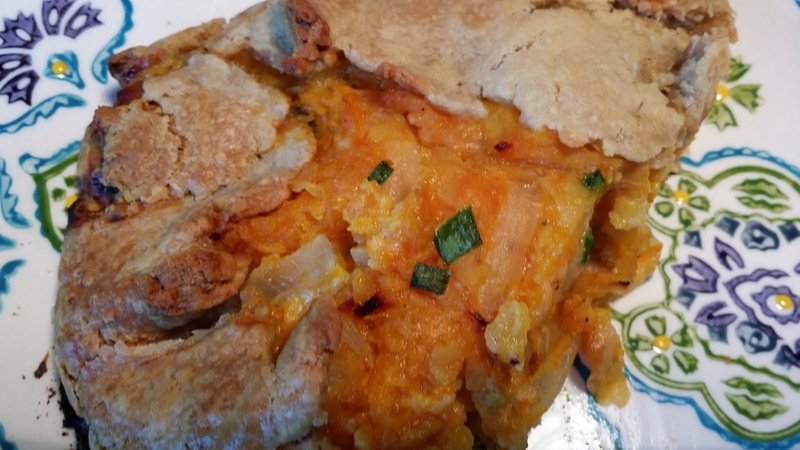 Sugar Free Low Gluten Pumpkin Pie--It's Yummy! And for the best pumpkin soup ever (of course, you have to make the ham to get the ham stock), but this recipe is spectacular--my family begs for it! It's from one of Chef Gordon Ramsay's Christmas specials. I've attached the video below, but I've also pasted in the actual recipes for your convenience. Fabulous! About 1.5kg cooking pumpkin . 1 bulb garlic, cut in half horizontally. 1 onion, peeled and chopped. Pinch of freshly grated nutmeg . 30g grated parmesan cheese (or a small block of parmesan rind). About 800ml hot ham stock or chicken stock. 1½ tbsp olive oil, plus extra to drizzle. 400g wild mushrooms (e.g. trompette de la mort, pied de mouton and chanterelle), cleaned and trimmed. 1.Preheat oven to 190°C/gas mark 5. First, cut the pumpkin in half horizontally and remove the seeds (reserve the seeds as they can be cleaned and roasted later). Score the pumpkin flesh using a small sharp knife and season with salt and pepper. Rub the pumpkin flesh with the cut garlic halves, then lay the rosemary sprigs and garlic pieces in the centre of each half. Drizzle both pumpkin halves with a little olive oil. .2.Put the pumpkin halves in large roasting trays and roast for 1-1½ hours, or until tender. (The exact cooking time will vary based on differences in oven temperature and the variety, shape, density and thickness of the pumpkin). The pumpkin is ready when you can effortlessly slip a knife into the thickest part of the flesh. Remove from the oven and allow to cool. Once cooled, remove the rosemary and garlic from the pumpkin and reserve the garlic. Scoop out the pumpkin flesh and set aside. .3.Heat the olive oil in a large saucepan. Add the onion and stir frequently for 5-6 minutes until translucent but not browned. Scoop out 2-3 cloves of the reserved roasted garlic and add to the pan along with a touch of seasoning and pinch of grated nutmeg. Continue to sauté for a further 1-2 minutes. Add the pumpkin flesh to the pan along with the grated parmesan and stir together. .4.Pour in the ham stock, bring to the boil then reduce the heat and simmer for 10-12 minutes. Stir in the double cream and heat for a further minute. In several batches, ladle the soup into a blender and blend until smooth. Add the butter and blitz again until you reach a rich, velvety smooth texture. Pour the soup into a clean pan to reheat. .5.For the garnish, heat a tablespoon of oil in a frying pan until hot and then add the mushrooms. Fry over a high heat for a few minutes until the moisture released from the mushrooms has cooked off and the pan is quite dry. Season the mushrooms and remove the pan from the heat. .6.Spoon the sautéed mushrooms into the middle of each serving bowl and top with parmesan shavings. Carefully pour the hot soup around the mushrooms and serve immediately. 3kg unsmoked boneless gammon joint. 4 medium carrots, peeled and roughly chopped . 1 leek, cleaned and roughly chopped . 1 onion, peeled and roughly chopped . 1 tsp black peppercorns, lightly crushed . 1 tsp coriander seeds, lightly crushed. 1 cinnamon stick, broken in half. 1.Put the gammon into a large saucepan and pour on enough cold water to cover. Add the carrots, leek, onion, peppercorns, coriander seeds, cinnamon stick and bay leaves. Bring to the boil, turn down to a simmer and cook for 3 hours, topping up with more boiling water if necessary. Skim off the froth and any impurities that rise to the surface from time to time. If cooking in advance, leave the ham to cool in the stock overnight. Otherwise, allow it to cool a little, then remove from the pan. Strain the stock (and save for soups, sauces, etc.). .3.and stir over a low heat. Bring to the boil, lower the heat and simmer for 3–4 minutes, until you have a glossy dark syrup. Do not leave unattended, as it can easily boil over. .4.Preheat the oven to 190°C/gas mark 5. Lift the ham onto a board. Snip and remove the string and then cut away the skin from the ham, leaving behind an even layer of fat. Lightly score the fat all over in a criss-cross, diamond pattern, taking care not to cut into the meat. Stud the centre of each diamond with a clove. .5.Put the ham into a roasting tin and pour half of the glaze over the surface. Roast for 15 minutes. .6.Pour on the rest of the glaze and return to the oven for another 25–35 minutes until the ham is golden brown, basting with the pan juices frequently. It also helps to turn the pan as you baste to ensure that the joint colours evenly. .7.Remove from the oven and leave to rest for 15 minutes before carving.